There’s something so comforting about a grilled cheese sandwich — crispy-crunchy on the outside, gooey on the inside with delicious melted cheese. 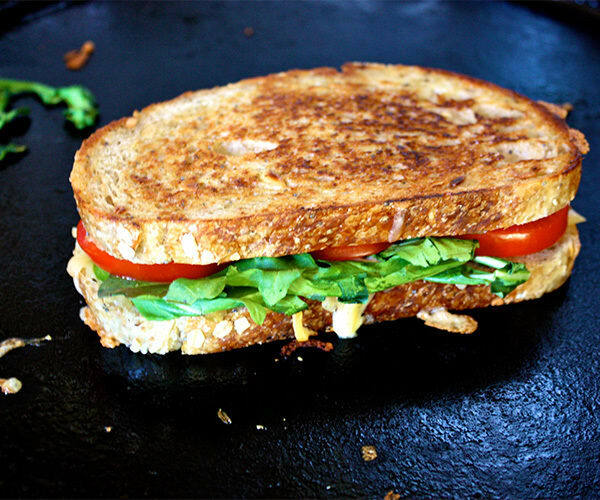 Think you can’t enjoy grilled cheese and eat healthy? We can help with that. The secret, besides making sure it’s not overloaded with cheese (sorry, kids), is choosing flavorful, quality ingredients that offer the most bang for calories. Our yummy grilled cheese recipe features smoked gouda, a boldly flavored cheese, so you can use less and still enjoy the cheesy goodness. A light spreading of Dijon mustard, roasted red peppers, and peppery arugula make this a grilled cheese sandwich you will crave again and again. This healthier Smoked Gouda Grilled Cheese sandwich has bold roasted red peppers, creamy Dijon mustard, fresh arugula, and smoked gouda cheese. Serve open-faced with a side of veggies and protein for lunch.